Rare tabular an prismatic crystals. Uisually occurs as fibrous, parallel veins that break aff intae cleavage fragments. Occurs as grainy, massive, or nodular masses an aw. 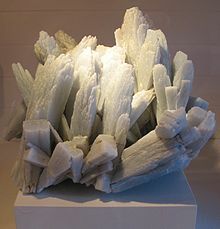 Anhydrite is a meeneral—anhydrous calcium sulphate, CaSO4.